Outside Play. Triple Threat Position. From triple-threat position, you are ready to shoot, pass, or make a dribble move. After catching the ball, square up to the basket. The knees and waist are slightly bent. The ball is protected from the defender on your shooting side ("in your hip pocket"). 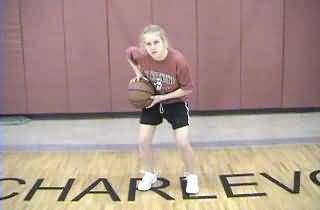 Your hands are positioned on the ball in the shooting position. Put your weight on your pivot foot (often the left foot for a right-handed player).